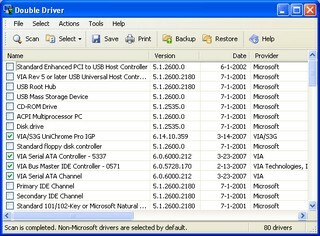 Double Driver is simple free software that allows you to analyzes your system and lists the most important driver details such as version, date, provider, etc and offers the latest version updates. 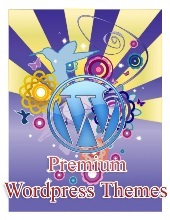 All drivers that are found can easily be backed up the application and easily restored at a later point in one go. 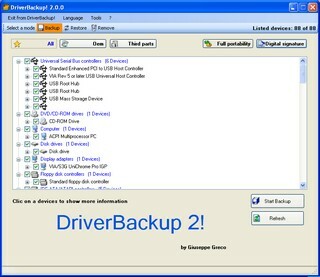 Driverbackup 2 is another free software created by Giuseppe Greco to backup and restore installed drives on windows Os .It requires Microsoft .NET Framework 2.0.Driverbackup 2 is available in three languages English , Spanish , Italiano and lack the option to check for updated version of Drivers . 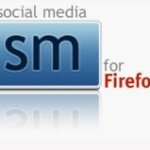 However Driverbackup 2 is quite simple to use .